You Are Here: Home > What are the Volkswagen Atlas Performance Specs? What are the Volkswagen Atlas Performance Specs? 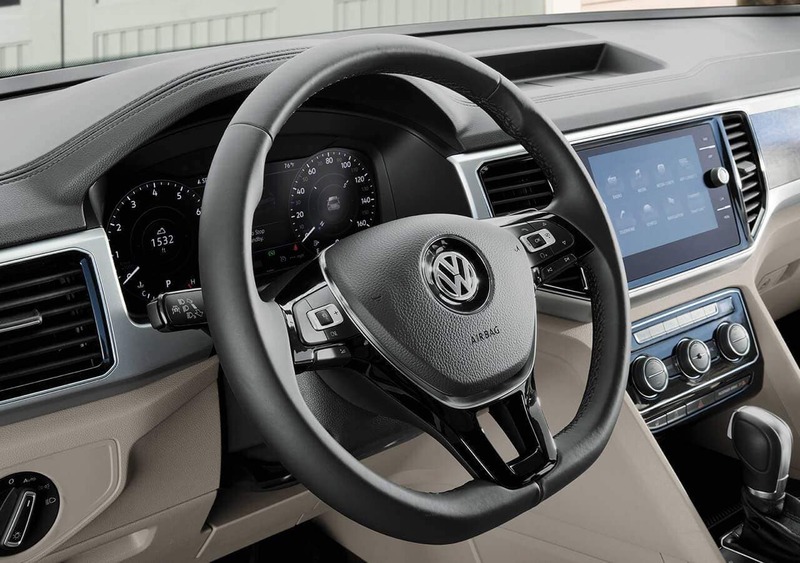 Volkswagen has brought the 3-row SUV to life for Glenview and Chicago drivers with the Volkswagen Atlas. Available in five unique trim levels, the Atlas provides plenty of passenger space paired with simple and sophisticated design. With seating for seven passengers and multiple cargo configurations, the Volkswagen Atlas is changing expectations in Evanston. Explore the engine performance the Atlas has to offer then visit Jennings Volkswagen to experience the Atlas in person. Engine options – The Volkswagen Atlas is available with two engines. The base 4 cylinder delivers 245 hp and 258 lb-ft of torque while the optional V6 delivers 276 hp. Transmission – All Atlas trims come standard with an eight-speed automatic transmission that provides a precise ride capable of handling any twist or turn. Climate Control – Keep comfortable with simple dials and minimal buttons on the center console. The rear seat features vents with separate fan and temperature controls to maximize comfort. Cargo Space – Behind the second row of seats is 55.5 cubic feet of space. Folding down the second row opens up 96.8 cubic feet of cargo volume. Front Assist – Pedestrian Monitoring uses a radar sensor to alert you with audible and visual warnings if a pedestrian is headed into the vehicle’s path. Blind Spot Monitor – Alerts you to vehicles in your blind spot when changing lanes. Rear Traffic Alert – Sensors alert you to vehicles crossing your path when you’re backing up. Lane Assist – Senses if you drift to another lane without using a turn signal and will help steer you back to the correct lane. Park Assist – Will help steer the vehicle into a parking space, either parallel or perpendicular. Adaptive Cruise Control – Maintains a preset distance from the car in front of you and will speed up and slow down your vehicle accordingly. Area View – Camera system that uses multiple cameras to help give you a better view on all sides. Explore the performance of the Volkswagen Atlas at Jennings Volkswagen in Glenview. Contact us at 844-742-1085 to schedule a test drive today!